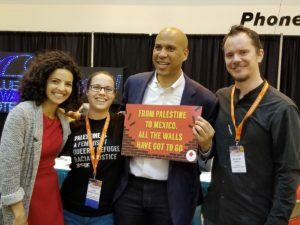 US politician and Senator Cory Booker has denied he endorsed the demolition of Israeli wall described by international community as apartheid wall, after holding a sign that read “From Palestine to Mexico, All the Walls Have Got to Go” at a pro-Palestinian conference over the weekend, The Intercept reports. Sen. Booker last weekend snapped a picture with members of pro-Palestinian US political group U.S. Campaign for Palestinian Rights (USCPR) at a conference put together by the group in New Orleans. Booker in the photograph appeared with three members of the group and held a sign that read “From Palestine to Mexico, All the Walls Have Got to Go”. The conference was attended by leftist and progressive activists who advocated for the end of the occupation of Palestine to secure a just future for both Israelis and Palestinians, The Intercept reports. The picture caused turmoil in pro-Israeli lobby groups in the U.S. The former mayor of Newark, New Jersey is a renowned African American figure aligned with the Israeli groups and government in Tel Aviv. Booker’s office issued a statement claiming the American politician was not aware of the message on the sign. “Just before delivering a speech in New Orleans, Senator Booker was approached by dozens of people for photos,” his spokesperson, Jeff Giertz, told the Jewish Telagraphic Agency, according to The Intercept. Booker despite his strident endorsement of Israel’s policies, earlier this year stunned Israeli groups after refusing to speak publicly at the American Israel Public Affairs Committee, knowns as AIPAC; the most powerful pro-Israeli government lobbying group in the U.S. The refusal and the weekend event generated hopes that Booker is leaning towards a progressive politicians. USCPR in statement to The Intercept fought out Booker’s claims noting that the presumed 2020 candidate was informed in advance of the event and its agenda. Booker in 2014 sided with Israel in its war with Hamas; the ruler movement of Gaza Strip. He blamed Hamas for the war in which thousands of Palestinians died in Israel bombardment using U.S. supplied arms and ammunitions. “Let us stand resolute and clear about the true cause of this crisis, and that lies squarely with Hamas, a terrorist organization whose ends do not start and finish with the well-being of the Palestinian people,” he said. In rare move, in 2015, following pressure then US leader Barack Obama, he endorsed the multinational nuclear deal signed between Iran and world powers – Israel chided the deal. The miles-long wall built by Israel and that separates the Jewish state and the occupied West Bank, has been condemned around the world and has been dubbed the “Apartheid wall”. Written by: KanelkaTagba on August 8, 2018. Posted by KanelkaTagba on Aug 8 2018. Filed under Headlines, World News. You can follow any responses to this entry through the RSS 2.0. Both comments and pings are currently closed.